What little I know of sword swallowing is that you start with a coat hanger. There is a lot of gagging and other noise that comes from the bathroom when your daughter is trying to teach herself how to swallow swords. I’ve never been tempted to learn, but have an unusual number of friends that can swallow swords. I purchased a copy of “Magic, Stage Illusions, Special Effects and Trick Photography” compiled and edited by Albert A. Hopkins. My book is a 1976 reprint of the 1898 book. I’ve learned many thing from this book, but for the most part I learned that magicians in 1898 depended heavily on top hats, canes, calling cards and vests. I can’t imagine a magician today going into an audience and expecting to borrow a pocket kerchief or hat. Maybe a ball cap? So for those considering magic as a career, this book is probably not for you. Giving bad ideas to medical science since 1777. I also am not sure this book is for the skeptic. While I’m sure most of the information given is accurate, the secret of the woman that walks on the ceiling would have anyone attempting it hurt. Suction cup shoes are not the secret to ceiling walking, no matter what the book informs us. Sword swallowing is an interesting part of the book. The book assures us that sword swallowing is most often not a trick, you can indeed “swallow” a sword. Where I have doubts is the assertion many sword swallow performers put a tip on the point of the sword. 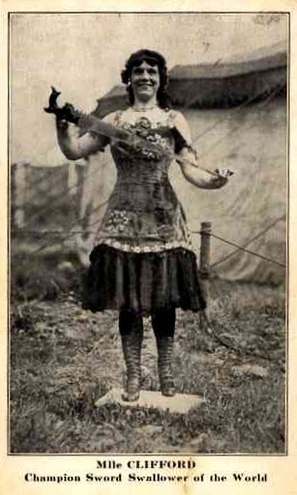 Common sense seems to suggest the main danger for a sword swallower is not from the tip. The sides of the sword seem to be a much more of a danger. I would assume most that perform the trick to not use an unusually sharply tipped sword, so would have no need of a rubber tip. 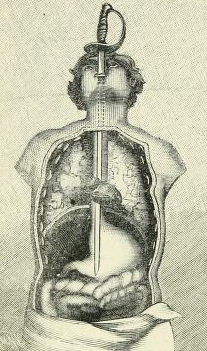 The next suggestion is that “…the majority of sword swallowers who exhibit upon the stage employ a guiding tube which they have previously swallowed, so that the experiments they are enabled to perform become less dangerous and can be varied more.” I do not believe I’ve ever seen a performance of sword swallowing in which a tube was first swallowed to “become less dangerous”. My only suspicion is that perhaps this explains vintage photographs of people with what seems an incredible number of swords being swallowed at once. Also the book notes the clever work of M.Voisin who invented the sword that collapses into the hilt, enabling anyone to pretend to swallow a sword safely. 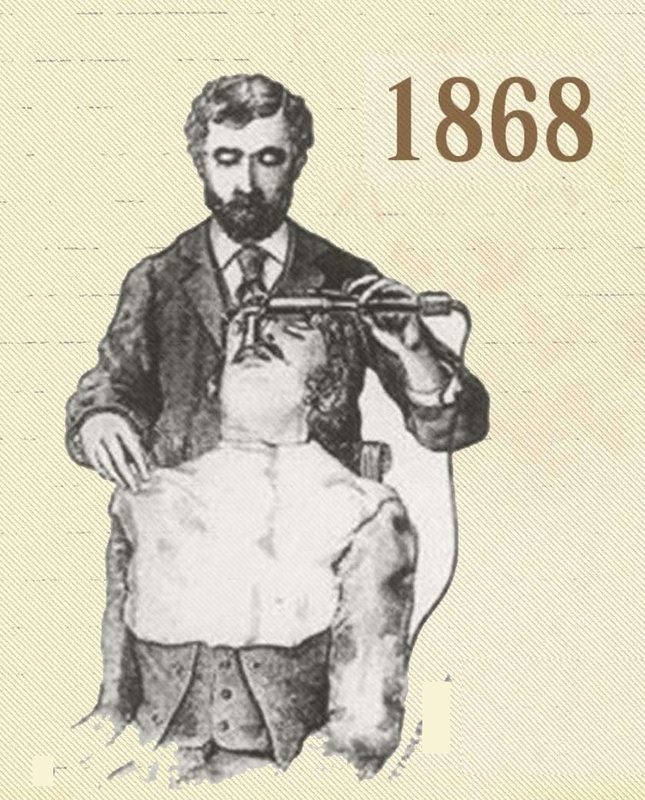 Doctors still do this, but things are a little more sterile and patients are a little more sedated. Goes down just like a sword, but I expect most of us would need our gag reflex to cooperate. I remember seeing in Brussels, Belgium a light swallower. This was a young male performer who swallowed tubes of light, which it seemed possible to view through his layers of skin and muscle. If this was true or a trick, it was a wonderful performance. 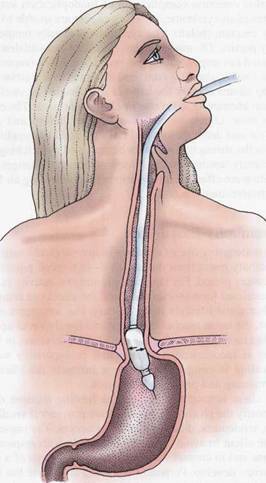 So thank you to the sword swallowers of yesterday who helped invent the Roucher tube, and other medical treatments and devices that give me chills just to read about them. While a sword swallower probably has no issues with the Roucher tube, I would need to be heavily sedated. 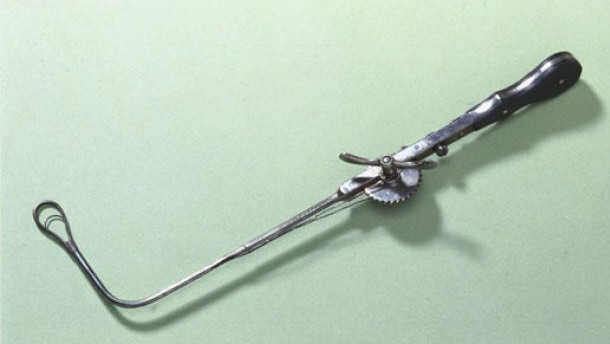 This medical object, with the nickname “The Crusher” was perhaps influenced by sword swallowers. I can’t find a photo of the infamous tubes mentioned. 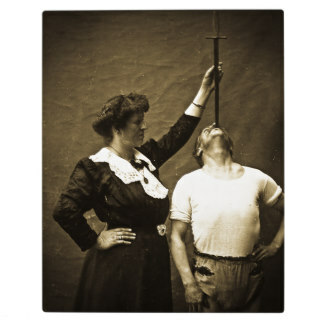 Todd Robbins, a terrific practitioner of the art of sword swallowing, confirmed that sword swallowers were instrumental in helping develop new scopes for physicians. Also, the guiding tube is NOT used. I was sure it wasn’t, because often the sword swallowing is part of a much longer act, would they really have a tube just sitting there for the entire performance!